Relationships can be tough for Pluto in the seventh house, for your desire to control the balance between you and your partner can get in the way. While you want peace and harmony it can come off as demanding or possessive. You need to be mindful of your partner’s feelings. Pluto has to do with renewal, rebirth, obsession and possessiveness. 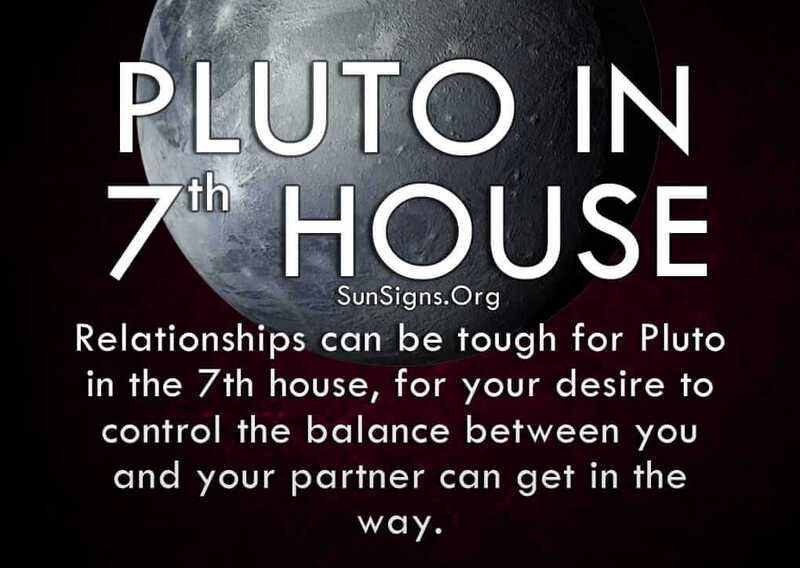 In the 7th house you deal with power struggles all the time, whether with your romantic partner, friends or family. You believe you are best suited to handle problems, and while you are a skilled mediator you sometimes leave out the feelings of the other person involved. But this is only because you fear the possibility of losing this person, and you want to keep things as calm and normal as possible. You hate chaos and get nervous every time the natural order of things is off-balance. And Libra, the ruling zodiac sign for this astrological house is all about finding the right balance in life. If you have Pluto in 7th house, you long to have intense passion and love for someone else where you could get lost in their presence. You have to figure out the right balance for your emotions, which can be difficult as you tend toward logic and reason over feelings. The one thing you really have to be careful of is how you choose your romantic partner. Because of your feelings towards balance and control, you may be with someone who doesn’t have a lot of self-esteem and looks to you for how they should think and act. With Pluto in seventh house, you strive to keep things going as smoothly as possible, even though that in and of itself can cause problems. You have to let people express when they are upset, rather than try to keep that from happening. In that way you become obsessive and controlling and no one wants to deal with that. You may also fear being in a close relationship for the same reason. Sometimes you wonder whether or not you can maintain your own identity in a partnership, so you shy away from being in one. Find out more from your Power Sign reading. It can also be difficult for people with Pluto in 7th house to make final decisions on their own, as they fear making the wrong one. This makes you indecisive at times, and you lean on someone else to make the choice for you. It’s a strange back and forth of wanting to be in control of the situation but not having the confidence to take it. You have to trust in your instincts and listen to your loved ones when they offer advice. You may come up against someone who challenges you at every turn just so you never get your way. Neither situation is particularly healthy, so make sure you get to know someone before making a serious commitment. You can sometimes bring out the worst in people with your obsessive nature, and they can bring out the worst in you by how they deal with your fears. This is because Pluto symbolizes the need for power in astrology. And both of you can claim being the victim, which doesn’t work out for anyone. Try to step back and take an objective view at your relationships to see if both of you are truly happy and healthy. Figure out what you want in life and determine the best path to make it happen. See if your partner wants to follow.